A week ago it was my birthday. Straight from a disability hearing tat Thursday that injected quite a bit of stress into the weeks leading up to it, days after a Social Security training in Jacksonville and days before a disability expo here in Gainesville I felt I needed a break. Do something fun and celebrate. A friend of mine invited me to go along with him to Tampa. He had ping pong tournament that Saturday morning, but I'd like to pretend we were going there for my birthday. Friday night my Foundation board had a last meeting before the event. Our new website was meant to go live that weekend and we were setting up materials for printing. I came with an overnight bag- my friend was picking me up soon after. The stress was about to kick back in in a few days, but for twenty four hours I wanted to celebrate turning thirty five- and looking good. Hey, I still get carded when ordering alcohol, that can't be bad, right? That night we decided to have some fun at the HardRock casino operated by the Seminole tribe. It's not about winning big or losing a lot of money, it's about having a bit of fun by the slot machines and not spending more that I could afford. My friend however had a bit of a different idea. While the lady dealer was smiling at him he played more and more and lost quite significantly more than I have by the black jack table. One thing that surprised me- was the lack of free alcohol. In every casino I've been to- and I have a cousin in Vegas- players get free drinks, but one still should tip a waitress who brought it. Here if you play you get a free soda or coffee. The casino felt hot, so we would often sit by the machines only so the girl with the tray would notice us and take our orders. Another strange thing- many machines had the lowest denomination buttons disabled. I guess they really want you to play high. Carpets. Have I mentioned the American obsession with carpets? Not only in rooms but out in the floors in hallways and lobbies. Perhaps it prevents people from slipping when walking too fast, but it's hard to get around when you're inn a wheelchair. The friction slows you down and it takes a lot more energy. It's funny- when I was walking in my leg braces and sticks the carpet was my ally and the smooth slippery surface was the enemy. Of course a carpet that was warn out or had sand or dirt on it was just as bad for the rubber tips on the end. I wouldn't feel safe walking on polished floors, today I'm advocating for less carpets. That trip was a gift that kept giving. Our companion who apparently started a celebration on their own - went missing. We spent the last few hours trying to find the missing member of my party. As my friend was pushing my wheelchair I may have dozed off for a minute or two. I had a stressful week and the upcoming one felt it was going to be just as full of tension. We made it home Saturday evening. I didn't even make it to my bed. I woke up ten hours later on my living room carpet. Later today we'll be presenting our foundation's new visual presence for the first time. After weeks of planning, changing, discussing and yes- arguing we'll be showing our new redesigned image to the world at the ADA Expo at the Sidney Lanier school in Gainesville. Our Twitter, Facebook and Website already have the new look. Our soft launch has a theme: Tell us your story. All our new materials that we will be distributing at the event were tailored to fit that theme. 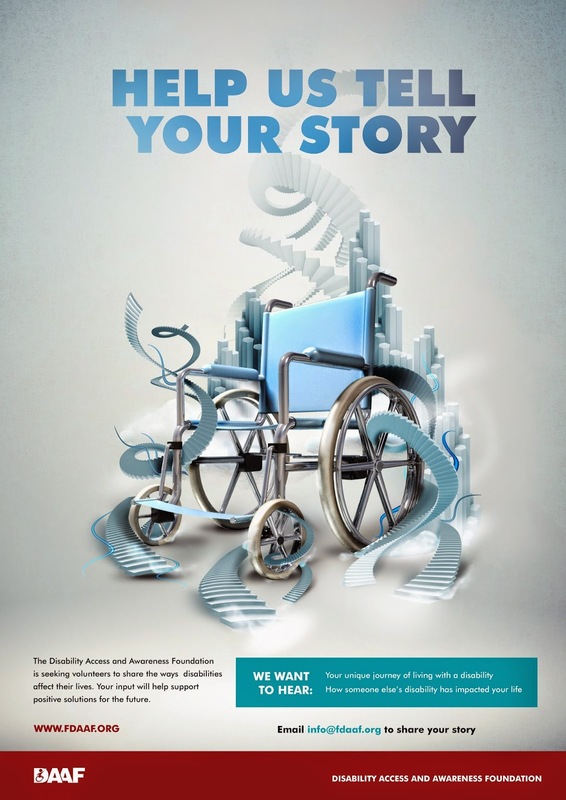 We want to hear from people with disabilities, their problems, successes and moments of glory . We want to reach out to those who were affected, changed or impressed by those with a disability. Part of our mission is of after all promotion of a positive image of a person with disability. Help us spread this message and join us at the EXPO today. The visuals were designed by the newest addition to our crew, the talented Jazzy Trafficano, who like me ended up in America after leaving Poland. She has designed visuals for award shows, branding for financial institutions, images for video games, posters, calendars, marketing material. Now we are fortunate to have her in our group. On our way back from Jacksonville my friend's car broke down. Apparently, when it gets too hot, his clutch gives in. At some point it gets cool again, all you have to do is wait. So we waited- twenty then another forty minutes until we realized that we are sitting in a truck without air conditioning on and we could be stuck here for a long time. We decided to find a Starbucks, because if we had to kill time I'd prefer we did over a cool cafe espresso frappuccino in a room with airflow. My friend decided we'd walk, meaning he'd pushed me- to wherever our GPS pointed us to. My phone was telling me that the closest cafe was in the very opposite direction, but my companion knew better. And added probably half a mile to our journey. While we were on our way I started to instinctively look for cover when the first raindrops hit my face. This is Florida. it may start raining as randomly and unexpectedly as it stops. I guess we were not in Jacksonville itself anymore, but one of those smaller places that are part of it's metropolitan area and have separate names. As we were hoping to get to our destination before it poured, my friend was pushing me with great determination and we were going fast. I was happy I didn't live there. I was happy I was not there by myself. Big intersection with lights changing fast and cars going even faster with something designed for walking in the middle of the street that was hard to get through in a wheelchair. Sidewalks and ramps at strange angles. A few times my friend almost send me flying. Many of the crossings had a crack in the place where the street and curb cut meet. My front wheels would fall perfectly into them. When you came at it fast the wheelchair would almost stand up trying to spring me out of my sit. Not a very wheelchair friendly place. It reminded me of a news story I read over a year ago about an otherwise successful criminal defense attorney who risked his life everyday getting to a courthouse in his wheelchair. Apparently the building didn't have a safe access for him so he'd end up navigating the traffic. Perhaps unfair, this the image of Jax that stuck in my mind. And I haven't seen anything to make me change my mind. As we found the Starbucks, the hallway leading to the bathroom had some stands obstructing my way. Had I walked it would have been fine. But I'm wider in a wheelchair. After I knocked some merchandise off with my elbow, I asked the baristas to move it for me. My friend decided to go back, check on his truck and bring it if it was running again. I couldn't find a sit, because the tables were so close together and pushed back you couldn't get between them in a chair. Two drinks later my friend returns. We decide to make a run for it, after waiting for a minute to see if it's going to rain. Someone from the cafe gives us some trashbags to cover my chair- my friend drives a truck after all. I know then that it's going to be a long week- with my first disability hearing Thursday, foundation's meeting Friday and my birthday Saturday. I'm done with this place and I'm ready to go home. I want to face what the next few days bring head on. On Monday I had a meeting at the Social Security office in Jacksonville. They needed to add me into the system and grant me privileges to view my clients' files that for some reason couldn't be done over the phone or Skype and took ten minutes to complete. These people mean business when it comes to data security. She added my profile to it, wrote the confirmation code, put the said code in some other system, texted my phone with an activation code and then asked me to log in to put that in as well. It wasn't really necessary for me to be there in person, but I guess that they're not used to having lawyers being the ones with mobility issues and having a hard time getting around not just the claimants. And as my friend pointed out, they must think everybody coming in is from the area. It's about an hour and a half in the car to get there and as you guessed it- I don't drive. We got there the night before, stayed at a hotel, so I wouldn't be late and hoping she'd see me a bit earlier. As it turns out she made me wait and was a bit late herself, but I didn't really mind. For a while I was sitting in their waiting room. I got to see people walking in and out and having conversations. It was a typical federal agency waiting room with a grey and brown decor that felt lifted from the 70's. And it was a new building. It really took me back to all those long hours spent waiting in Immigration centers. I don't know why they can't make these places nicer and more pleasant. As I waiting two women were waiting for another thing- the hearing. A lady who identified herself as a stenographer soon came along and they started a conversation. She was very talkative, eager and wanted to put their minds at ease. She described the judge, the room and what the hearing would look like. The women they responded that they wanted to reschedule the hearing, that they had some medical records meeting and would prefer to consult an attorney. The stenographer encouraged them to go ahead anyway saying "What will a lawyer do?". It was none of my business so I didn't say anything. It's not like going to look for clients in Jacksonville, so I'm not invested in this anyway, but you do need a lawyer in a Social Security hearing. It is my experience that often people present the wrong type of evidence, don't know what things will present their case better, what elements you need to prove and highlight them better. Remember: SSA has a very specific definition of disability, it's not as simple as having an impairment of some kind.Telling somebody they don't need a lawyer without knowing much about the condition or having seen their file to see what they submitted is very dangerous. Given that a social security attorney is typically paid through SSA and is strongly limited as to how and what for can be compensated I don't quite get the benefit of not getting one. As I continued to wait a very agitated man showed up. In a suit, on a cellphone. An attorney. And then something amazing happened. He came up too the receptionist and demanded they receive faxes from his office for him. Strong willed and controlling he meant business and was not here to play. And the people who usually seem very dismissive on the phone, like they do you a favor because they answer were kind and responsive and doing what he asked. The things you learn by people watching at the Social Security Office! On Monday I'll be in Jacksonville. In order to file documents electronically for my disability clients I have to physically meet with a Social Security officer. Not only do I need to show up in person, but - to gain access- I must bring an SMS enabled phone for some reason. It's a bit of a drive so my friend and I decided to get there the night before to explore the city a bit. I still don't understand why I couldn't do all this remotely- over my cell, the internet or some form of webinar. I guess Social Security doesn't quite realize, that some of the attorneys may have disabilities just like their clients do and travel is always a great hassle. As a sidenote- SSA definition is of course a bit different and includes inability to work, so by their standards I'm not "disabled". That Thursday months of preparation for my first disability clients will culminate in a hearing here in Gainesville in front of a judge that is actually in California. It's my birthday two days later and my friends are beginning to ask where I want to go and what I want to do. Did you know that although I've lived in Florida for ten years I've never been to any of the Disney theme parks here? It would be quite an expedition, but it sounds like fun. On the 24th our Foundation will be making its debut at the American with Disabilities Act Expo in Gainesville. For us it's an urgent call to show our work and what we have been doing so far. I like having hard deadlines- it forces us to deliver, but it also makes us figure out where we are and what we are missing. And things have been quite exciting- we have a new creative manager, a recent transplant to Florida from Poland- and a pretty successful artist. I wish I could show you some of her designs, things that she seems to pop up so effortlessly, in no time at all, in the middle of the night. It tells you that presentation really is key, that strong visual presence is important. If you want to be treated as a professional, you've got to look professional. When I looked at her preliminary designs my jaw drops. And with every new entry it continues to drop. It's amazing to see how our ideas that may had sounded lofty and ambitious finally taking shape and materialize. And I see, but then again I always new this- were we failed with this project before. And where Jordan Klausner Foundation's efforts - although you got to applaud them for trying and determination- has failed prior to that. Delivering a well executed, powerful, visual message. I found their old brochure today. It was informative and has a lot of text, but it just didn't grab me. And I started to wonder- how many other nonprofits lose out because the fail to grab people's attention and attract them to the cause. It's a collaborative proccess- so we all look at things and read and discuss and comment. Things seem to be going well in that department. Our presence will be accompanied by new materials- flyers and business cards that follow that same design. We also expect to have some kind of a video presentation also edited by her and perhaps the accessibility app itself in some early stage. We're meeting to film again tomorrow. All this between phone calls from acquaintances to help them write a will or get their inheritance. I apologize for not writing as frequently recently. Give me two weeks. I do have a bit on my plate right now.